Vice President Mike Pence said Tuesday that federal aid would soon arrive for communities impacted by historic flooding in the Midwest. The latest: Pence visited a relief shelter in Omaha, Nebraska, and surveyed flood damage in the region during a tour of the region. The Nebraska Farm Bureau said farm and ranch losses from the flooding could total $1 billion and there would be up to $500 million in livestock losses, according to the Associated Press. 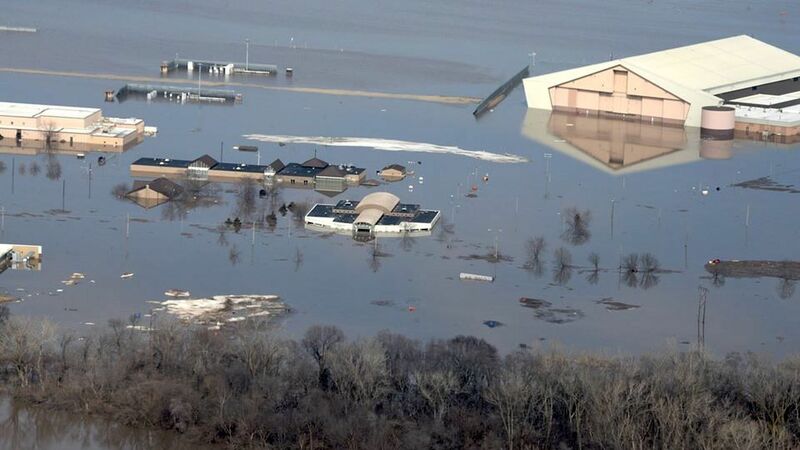 The big picture: Nebraska, Wisconsin and Iowa declared states of emergency after melting snow and heavy rain from a "Bomb Cyclone" in the Midwest caused deadly, historic flooding around the Platte and Missouri rivers. Nebraska Gov. Pete Ricketts said it's the worst flooding in the state for 50 years. At least three people have died in the floods.